Horses are regularly being "fly-tipped" and left to die by irresponsible owners, the RSPCA has told the Victoria Derbyshire programme. One mare had been dumped by the side of the road while trying to give birth, it said. The mother and foal both died. The charity said the problem was partly that horses were cheap to buy but expensive to maintain, especially if they needed veterinary care. It said prosecution cases involving horses had risen by 25% since 2015. RSPCA chief inspector Sam Garvey said it had taken care of horses that had been "literally dumped down dirt tracks along with the rubbish". Almost 1,000 horses were rescued by the RSPCA in England and Wales last year, the highest number for four years. 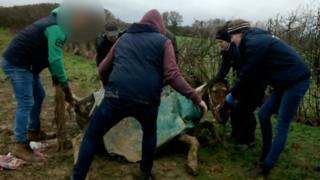 The animal welfare charity described it as a "horse crisis" and said some owners felt it was not worth paying a vet to treat an ill horse, or put the animal to sleep and dispose of the body. Ms Garvey said she had also rescued a Shetland pony from a 19th floor flat in London, whose owner had taken it there via the lift. A report published in 2015 estimated that there were nearly 800,000 horses in the UK. The RSPCA runs private stables which nurses rescued horses back to health. It is currently caring for more than 850. One of those currently being treated is Adie, who was found collapsed and covered in mud on a footpath on New Year's Eve. It is thought he had become ill, so his owner had dumped him there to die. "It took five people to try and get him up. "It was very touch and go - often when a horse goes down it's the end, so you have to put a lot of hard work and time and effort to get them back on their feet," said Ms Garvey. Ms Garvey said she had seen horses being sold online "cheaper than a kitten". "There were horses for as cheap as £25, horses for free, 'buy the mare, get the foal for free'. [It's] horrifying." She compared this with the cost of treating a horse with colic, which can be as much as £4,000 to £5,000. Prosecutions involving horses have risen by 25% in the last two years, to 225 in 2017. The charity said people who were finding their animals too expensive to look after should seek professional advice, from either local instructors or charities.